Garage doors should be repainted on a regular basis, as that will ensure their condition, as well as their appearance, will be preserved. A good looking door will greatly enhance the curb appeal of your home, and one that doesn't develop rust will be able to remain secure and will suffer from fewer malfunctions. When buying paint for your door, general painting manuals are usually provided, so as to ensure that the paint is used to the maximum effect. 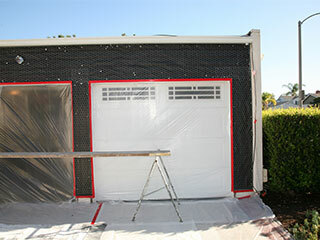 We advise that you ensure that you take all the necessary precautionary steps before starting to paint. Wearing gloves and protective clothing is also very important. It is important to make sure that you thoroughly clean the door before you do anything else. This helps to expose panels as dirt tends to form a coating that might prevent the paint from sticking or will create chunky spots. If there are sections of your door with peeling pieces of paint, you'd be wise to carefully remove and sand them before applying the new layer. Oil based paint is usually more appropriate when compared to water based paint. It lasts longer too. However, if your door will be prone to fire risks it is important to ensure that you use water based paint, to reduce the risk. Oil-based paint tends is, obviously, much more flammable. The material your door is made of will also determine which type of paint you'll need to use. We advise that you paint wood with water-based paint and use an oil-based material for steel. When actually painting the door, it is important to make sure that you overlap each section in order to maintain uniformity of appearance. Paint manuals can guide you on how to obtain a smoother more consistent look. Just remember to cover the hinges and other parts of your garage door system to keep them from getting accidentally splattered with paint. While you're at it, you may as well give each part a thorough examination to check and make sure that its condition is optimal. If you find any type of problem, contact our team at Garage Door Repair Conroe right away.